The following recipe needs no roasting (hopefully! ), no baking, no grilling, and no heat at all!! 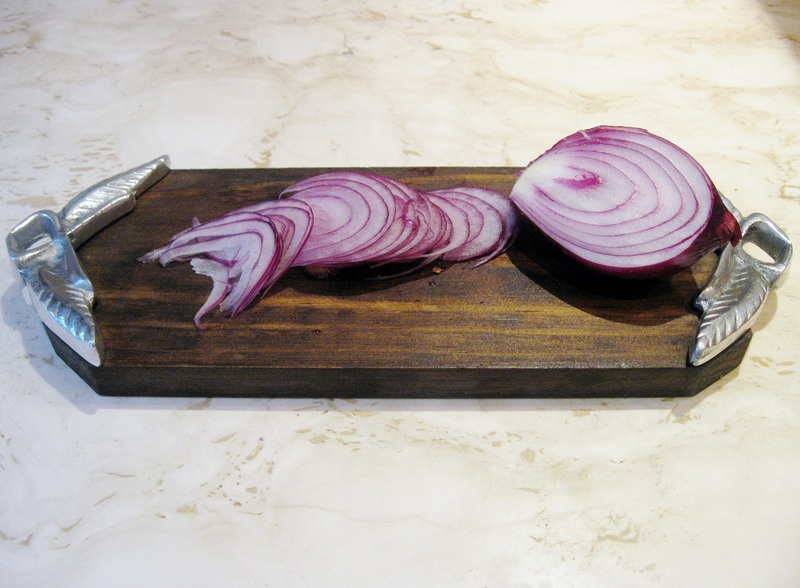 It could be served as an appetizer or as a vegetarian main course. 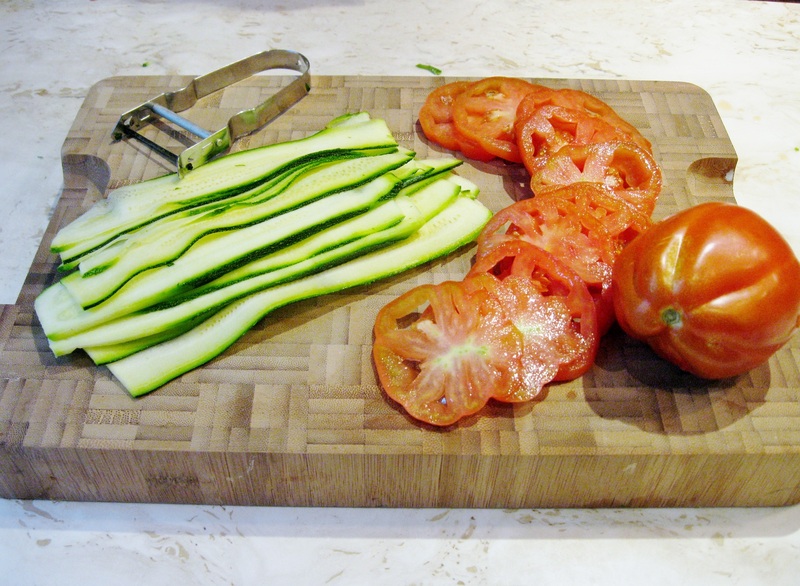 Using a potato peeler, slice zucchini very thinly and lengthwise. Slice tomatoes. 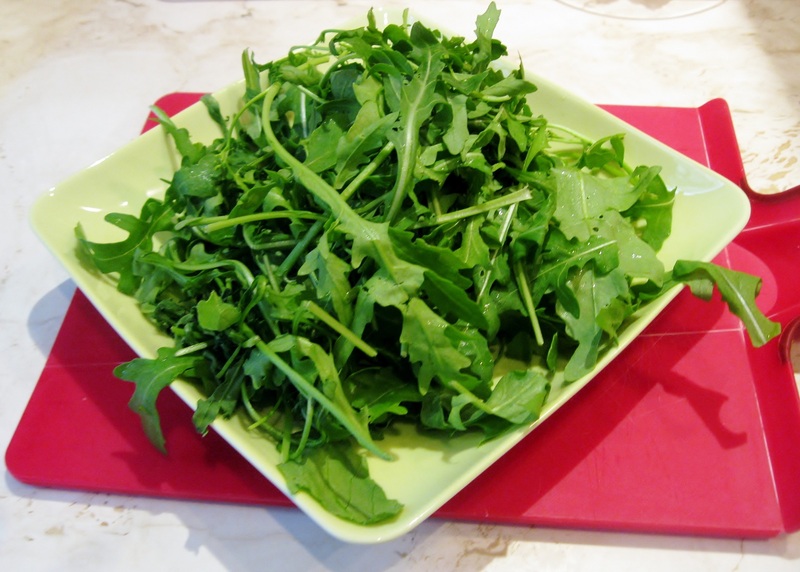 This is rughetta, which is a type of rucola very common in Rome. Rughetta in Italian means “little arugula” since the leaves are thinner and smaller. 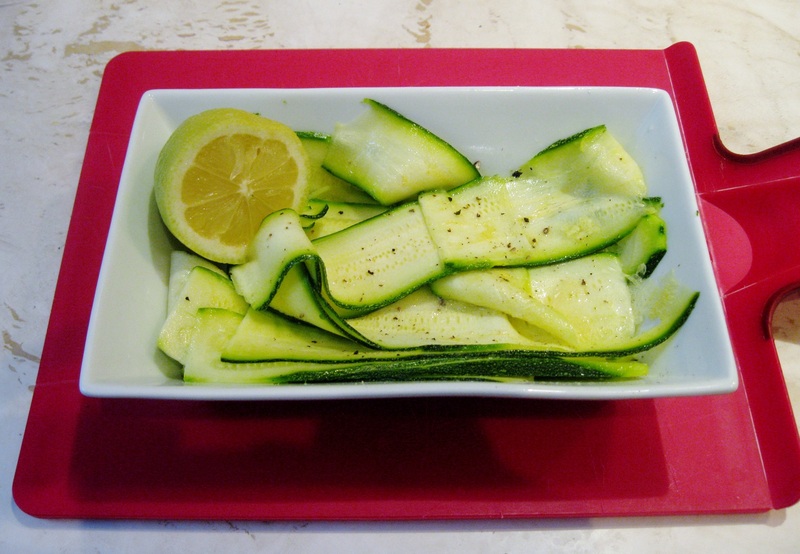 Marinate zucchini with lemon juice for about 15 to 20 minutes. Add salt and pepper. 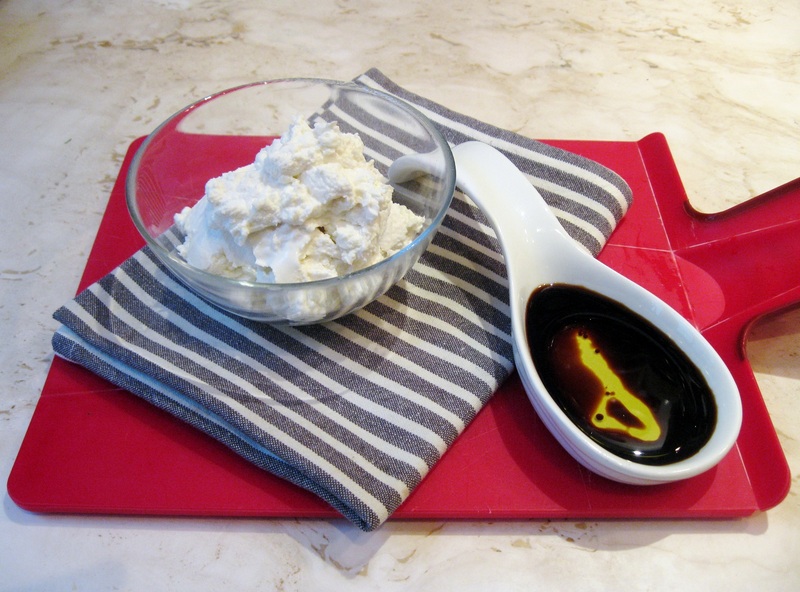 You can use any type of soft goat cheese. I used robiola. 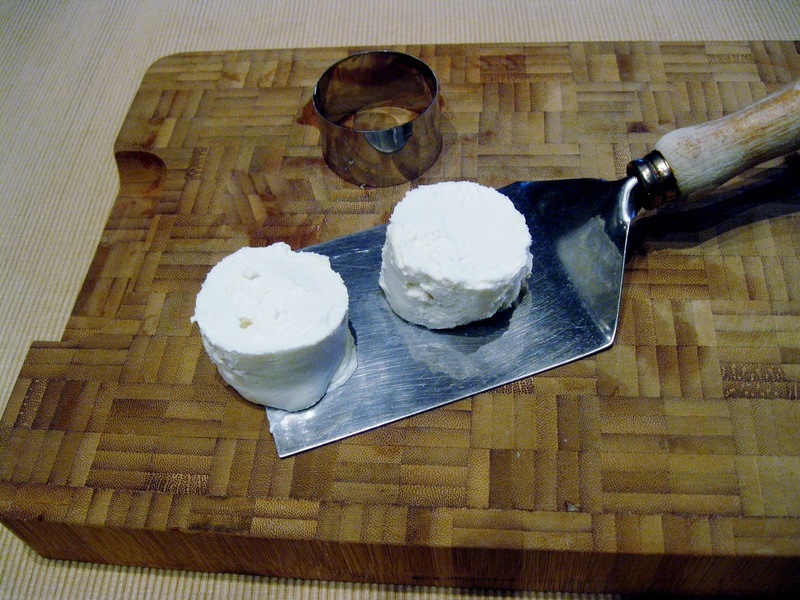 Using a small round pasta cutter, shape goat cheese into rounds. 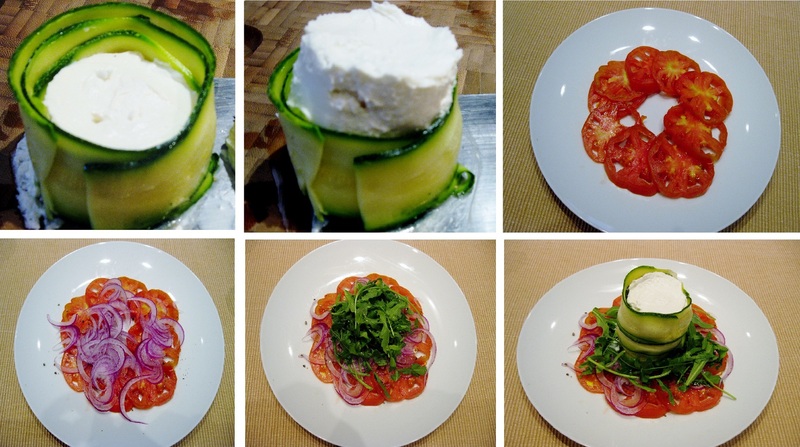 Carefully wrap each cheese round with zucchini slices (I used four slices). When you are done with one cheese round, place another round on top and continue wrapping. In this case you can stop at two wraps, but I continued with a third cheese round. On a plate, place tomatoes slices, and add salt and pepper. Place onions slices and arugula on top. Season with salt and pepper. Carefully place zucchini-cheese wraps. Sprinkle with extra virgin olive oil, balsamic vinegar and black pepper. What a beautiful way to showcase the fruits of Summer! I bet the “sprinkle” of balsamic really takes the dish to another level. Great recipe! Thank you! Yes balsamic vinegar gives the dish a magic touch! A beautiful chilled dish for a hot day! Your ‘rughetta’ looks like what we call wild rocket which has a stronger flavour than the cultivated variety – I love it! Yes you got it!! Thank you! I have a lovely picture of you and your husband zooming around Rome like Audrey Hepburn and Gregory Peck in Roman Holiday! We used to have to go through Rome twice in August in our way to and from Calabria – way too hot! 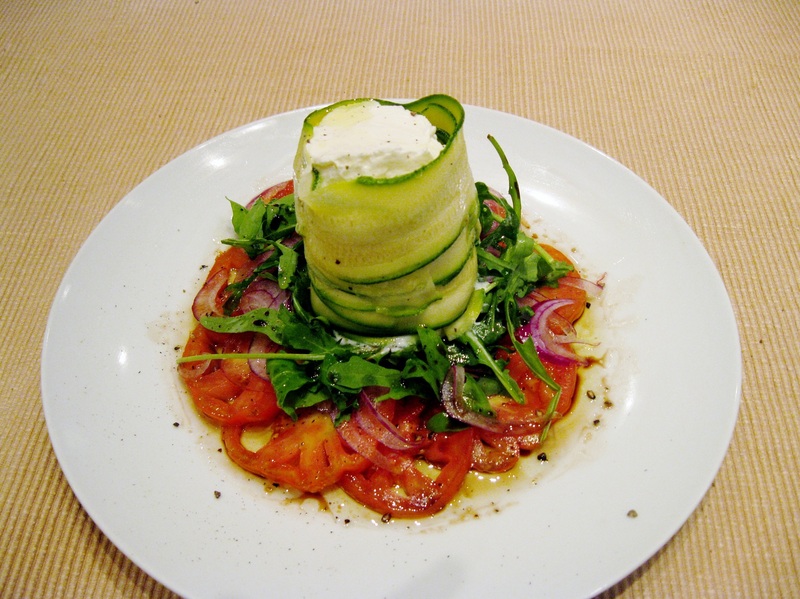 This looks absolutely gorgeous, I make something similar but not with such gorgeous cheese (which I had never heard of). Big Man came home today with about 8 kilos of zucchini from his brother in law today so am looking for ways to use them up! You have just made me laugh!! You are too funny!! Thank you!!! I bet you’ll make wonders with those zucchini!! Goat cheese and squash are just such a great combo. This is quite an elaborate dish! Thank you!! It seems elaborate but it is easy to make!! Such a beautiful dish with complimentary flavors. This is a definite must do recipe…simple and pretty. Thank you Karen!! You are so sweet!! Gorgeous presentation! Love the fresh ingredients, and no cooking is wonderful! I know you must be hot on that scooter, but visualizing it on my end, it just sounds so romantic and European! I’d visit regardless of the weather!! Yeap!! no cooking is wonderful, specially at 105°F. Thanks for the lovely comment! This looks amazing..like it came off the menu of a 5 star restaurant! and the best part is it does NOT require any heat! Thank you. I am really flattered!!! It came out of a tiny tiny kitchen in Rome! Thank you!!!! You are very kind! !